George Gamow (March 4 [O.S. February 20] 1904 – August 19, 1968), born Georgiy Antonovich Gamov (Russian: Гео́ргий Анто́нович Га́мов; IPA: [ɡʲɪˈorɡʲɪj ɐnˈtonəvʲɪtɕ ˈɡaməf]), was a theoretical physicist and cosmologist. He was an early advocate and developer of Lemaître's Big Bang theory. He discovered a theoretical explanation of alpha decay via quantum tunneling, and worked on radioactive decay of the atomic nucleus, star formation, stellar nucleosynthesis and Big Bang nucleosynthesis (which he collectively called nucleocosmogenesis), and molecular genetics. In his middle and late career, Gamow focused more on teaching and wrote popular books on science, including One Two Three ... Infinity and the Mr Tompkins ... series of books (1939–1967). Some of his books are still in print, more than a half-century after their original publication. Gamow was born in Odessa, Russian Empire. His father taught Russian language and literature in high school, and his mother taught geography and history at a school for girls. In addition to Russian, Gamow learned to speak some French from his mother and German from a tutor. Gamow learned fluent English in his college years and later. Most of his early publications were in German or Russian, but he later switched to writing in English for both technical papers and for the lay audience. He was educated at the Novorossiya University in Odessa (1922–23) and at the University of Leningrad (1923–1929). Gamow studied under Alexander Friedmann for some time in Leningrad, until Friedmann's early death in 1925. He aspired to do his doctoral thesis under Friedmann, but had to change dissertation advisors. At the University, Gamow made friends with three other students of theoretical physics, Lev Landau, Dmitri Ivanenko, and Matvey Bronshtein (who was later arrested in 1937 and executed in 1938 by the Soviet regime). The four formed a group known as the Three Musketeers, which met to discuss and analyze the ground-breaking papers on quantum mechanics published during those years. He later used the same phrase to describe the Alpher, Herman, and Gamow group. On graduation, he worked on quantum theory in Göttingen, where his research into the atomic nucleus provided the basis for his doctorate. He then worked at the Theoretical Physics Institute of the University of Copenhagen, from 1928 to 1931, with a break to work with Ernest Rutherford at the Cavendish Laboratory, Cambridge. He continued to study the atomic nucleus (proposing the "liquid drop" model), but also worked on stellar physics with Robert Atkinson and Fritz Houtermans. In 1931 Gamow was elected a corresponding member of the Academy of Sciences of the USSR at age 28 – one of the youngest in the history of this organization. During the period 1931–1933, George Gamow worked in the Physical Department of the Radium Institute (Leningrad) headed by Vitaly Khlopin. Under the guidance and direct participation of Igor Kurchatov, Lev Mysovskii and George Gamow, Europe's first cyclotron was designed. In 1932, George Gamow and Lev Mysovskii submitted a draft design for consideration by the Academic Council of the Radium Institute, which approved it. The cyclotron was not completed until 1937. In the early 20th century, radioactive materials were known to have characteristic exponential decay rates, or half-lives. At the same time, radiation emissions were known to have certain characteristic energies. By 1928, Gamow had solved the theory of the alpha decay of a nucleus via tunnelling, with mathematical help from Nikolai Kochin. The problem was also solved independently by Ronald W. Gurney and Edward U. Condon. Gurney and Condon did not, however, achieve the quantitative results achieved by Gamow. Classically, the particle is confined to the nucleus because of the high energy requirement to escape the very strong nuclear potential well. Also classically, it takes an enormous amount of energy to pull apart the nucleus, an event that would not occur spontaneously. In quantum mechanics, however, there is a probability the particle can "tunnel through" the wall of the potential well and escape. Gamow solved a model potential for the nucleus and derived from first principles a relationship between the half-life of the alpha-decay event process and the energy of the emission, which had been previously discovered empirically and was known as the Geiger–Nuttall law. Some years later, the name Gamow factor or Gamow–Sommerfeld factor was applied to the probability of incoming nuclear particles tunnelling through the electrostatic Coulomb barrier and undergoing nuclear reactions. Gamow worked at a number of Soviet establishments before deciding to flee the Soviet Union because of increased oppression. In 1931, he was officially denied permission to attend a scientific conference in Italy. Also in 1931, he married Lyubov Vokhmintseva (Russian: Любовь Вохминцева), another physicist in Soviet Union, whom he nicknamed "Rho" after the Greek letter. Gamow and his new wife spent much of the next two years trying to leave the Soviet Union, with or without official permission. 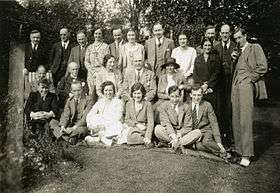 Niels Bohr and other friends invited Gamow to visit during this period, but Gamow could not get permission to leave. Gamow later claimed that his first two attempts to defect with his wife were in 1932 and involved trying to kayak: first a planned 250-kilometer paddle over the Black Sea to Turkey, and another attempt from Murmansk to Norway. Poor weather foiled both attempts, but they had not been noticed by the authorities. In 1933 Gamow was suddenly granted permission to attend the 7th Solvay Conference on physics, in Brussels. He insisted on having his wife accompany him, even saying that he would not go alone. Eventually the Soviet authorities relented and issued passports for the couple. The two attended and arranged to extend their stay, with the help of Marie Curie and other physicists. Over the next year, Gamow obtained temporary work at the Curie Institute, University of London, and University of Michigan. In 1934, Gamow and his wife moved to the United States. He became a professor at George Washington University (GWU) in 1934 and recruited physicist Edward Teller from London to join him at GWU. In 1936, Gamow and Teller published what became known as the "Gamow–Teller selection rule" for beta decay. During his time in Washington, Gamow would also publish major scientific papers with Mário Schoenberg and Ralph Alpher. By the late 1930s, Gamow's interests had turned towards astrophysics and cosmology. In 1935, Gamow's son, Igor Gamow was born. George Gamow became a naturalized American in 1940. He retained his formal association with GWU until 1956. During World War II, Gamow did not work directly on the Manhattan Project producing the atomic bomb, in spite of his knowledge of radioactivity and nuclear fusion. He continued to teach physics at GWU and consulted for the US Navy. Gamow was interested in the processes of stellar evolution and the early history of the Solar System. In 1945, he co-authored a paper supporting work by German theoretical physicist Carl Friedrich von Weizsäcker on planetary formation in the early Solar System. Gamow published another paper in the British journal Nature in 1948, in which he developed equations for the mass and radius of a primordial galaxy (which typically contains about one hundred billion stars, each with a mass comparable with that of the Sun). George Gamow led the development of the hot "big bang" theory of the expanding universe. He was the earliest to employ Alexander Friedmann's and Georges Lemaître's non-static solutions of Einstein's gravitational equations describing a universe of uniform matter density and constant spatial curvature. Gamow's crucial advance would provide a physical reification of Lemaître's idea of a unique primordial quantum. Gamow did this by assuming that the early universe was dominated by radiation rather than by matter. 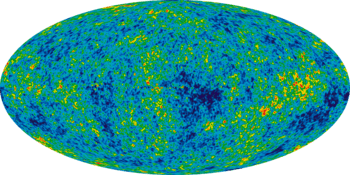 Most of the later work in cosmology is founded in Gamow's theory. He applied his model to the question of the creation of the chemical elements  and to the subsequent condensation of matter into galaxies, whose mass and diameter he was able to calculate in terms of the fundamental physical parameters, such as the speed of light c, Newton's gravitational constant G, Sommerfeld's fine-structure constant α, and Planck's constant h.
Gamow's interest in cosmology arose from his earlier interest in energy generation and element production and transformation in stars. This work, in turn, evolved from his fundamental discovery of quantum tunneling as the mechanism of nuclear alpha decay, and his application of this theory to the inverse process to calculate rates of thermonuclear reaction. At first, Gamow believed that all the elements might be produced in the very high temperature and density early stage of the universe. Later, he revised this opinion on the strength of compelling evidence advanced by Fred Hoyle et al. 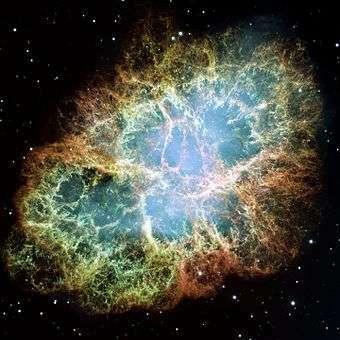 that elements heavier than lithium are largely produced in thermonuclear reactions in stars and in supernovae. Gamow formulated a set of coupled differential equations describing his proposed process and assigned, as a PhD. dissertation topic, his graduate student Ralph Alpher the task of solving the equations numerically. These results of Gamow and Alpher appeared in 1948 (co-authored with Hans Bethe) as the αβγ paper. Bethe later referred to this paper as being "wrong". Before his interest turned to the question of the genetic code, Gamow published about twenty papers on cosmology. The earliest was in 1939 with Edward Teller on galaxy formation, followed in 1946 by the first description of cosmic nucleosynthesis. He also wrote many popular articles as well as academic textbooks. In 1948 he published a paper dealing with an attenuated version of the coupled set of equations describing the production of the proton and the deuteron from thermal neutrons. By means of a simplification and using the observed ratio of hydrogen to heavier elements he was able to obtain the density of matter at the onset of nucleosynthesis and from this the mass and diameter of the early galaxies. In 1953 he produced similar results, but this time based on another determination of the density of matter and radiation at the point at which they became equal. In this paper Gamow determined the density of the relict background radiation from which a present temperature of 7K is trivially predicted - a value slightly more than twice the presently accepted value. In 1967 he published a reminder and recapitulation of his own work as well as that of Alpher and Robert Herman (both with Gamow and also independently of him). This was prompted by the discovery of the cosmic background radiation by Penzias and Wilson in 1965, for which Gamow, Alpher and Herman felt that they did not receive the credit they deserved for their prediction of its existence and source. Gamow was disconcerted by the fact that the authors of a communication explaining the significance of the Penzias/Wilson observations failed to recognize and cite the previous work of Gamow and his collaborators. After the discovery of the structure of DNA in 1953 by Francis Crick, James D. Watson, Maurice Wilkins and Rosalind Franklin, Gamow attempted to solve the problem of how the order of the four different kinds of bases (adenine, cytosine, thymine and guanine) in DNA chains could control the synthesis of proteins from amino acids. Crick has said that Gamow's suggestions helped him in his own thinking about the problem. As related by Crick, Gamow suggested that the twenty combinations of four DNA bases taken three at a time corresponded to the twenty amino acids that form proteins. This led Crick and Watson to enumerate the twenty amino acids common to proteins. Gamow's contribution to solving the problem of genetic coding gave rise to important models of biological degeneracy. The specific system proposed by Gamow (known as "Gamow's diamonds") was incorrect, as the triplets were supposed to be overlapping, so that in the sequence GGAC (for example), GGA could produce one amino acid and GAC another, and also non-degenerate (meaning that each amino acid would correspond to one combination of three bases – in any order). Later protein sequencing work proved that this could not be the case; the true genetic code is non-overlapping and degenerate, and changing the order of a combination of bases does change the amino acid. In 1954, Gamow and Watson co-founded the RNA Tie Club, a discussion group of leading scientists concerned with the problem of the genetic code. In his own autobiographical writings, Watson later acknowledged Gamow's ideas and colorful personality as a "zany", card–trick playing, limerick–singing, booze–swilling, practical–joking "giant imp”. Gamow worked at George Washington University from 1934 until 1954, when he became a visiting professor at the University of California, Berkeley. In 1956, he moved to the University of Colorado Boulder, where he remained for the rest of his career. In 1956, Gamow became one of the founding members of the Physical Science Study Committee (PSSC), which later reformed teaching of high-school physics in the post-Sputnik years. Also in 1956, he divorced his first wife. Gamow later married Barbara Perkins (an editor for one of his publishers) in 1958. In his 1961 book The Atom and its Nucleus, Gamow proposed representing the periodic system of the chemical elements as a continuous tape, with the elements in order of atomic number wound round in a three-dimensional helix whose diameter increased stepwise (corresponding to the longer rows of the conventional periodic table). Gamow continued his teaching at the University of Colorado Boulder and focused increasingly on writing textbooks and books on science for the general public. After several months of ill health, surgeries on his circulatory system, diabetes and liver problems, Gamow was dying from liver failure, which he had called the "weak link" that could not withstand the other stresses. In a letter written to Ralph Alpher on August 18, he had written, "The pain in the abdomen is unbearable and does not stop". Prior to this, there had been a long exchange of letters with his former student, in which he was seeking a fresh understanding of some concepts used in his earlier work, with Paul Dirac. Gamow relied on Alpher for deeper understanding of mathematics. 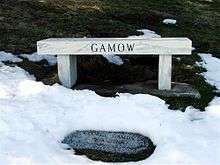 On August 19, 1968, Gamow died at age 64 in Boulder, Colorado and was buried there in Green Mountain Cemetery. 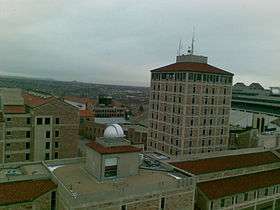 The physics department tower at the University of Colorado at Boulder is named for him. Gamow was a highly successful science writer, with several of his books still in print more than a half-century after their initial publication. As an educator, Gamow recognized and emphasized fundamental principles that were unlikely to become obsolete, even as the pace of science and technology accelerated. He also conveyed a sense of excitement with the revolution in physics and other scientific topics of interest to the common reader. Gamow himself sketched the many illustrations for his books, which added a new dimension to and complemented what Gamow intended to convey in the text. Wherever it was essential, he was unafraid to introduce mathematics, but he tried to avoid scaring off potential readers with too many equations that did not illustrate essential points. In 1956, he was awarded the Kalinga Prize by UNESCO for his work in popularizing science with his Mr. Tompkins... series of books (1939–1967), his book One, Two, Three...Infinity, and other works. Before his death, Gamow was working with Richard Blade on a textbook Basic Theories in Modern Physics, but the work was never completed or published under that title. Gamow was also writing My World Line: An Informal Autobiography, which was published posthumously in 1970. A collection of Gamow's writings was donated to The George Washington University in 1996. The materials include correspondence, articles, manuscripts and printed materials both by and about George Gamow. The collection is currently under the care of GWU's Special Collections Research Center, located in the Estelle and Melvin Gelman Library. One Two Three ... Infinity (1947, revised 1961), Viking Press (copyright renewed by Barbara Gamow, 1974), Dover Publications, ISBN 0-486-25664-2, illustrated by the author. Dedicated to his son, Igor Gamow, it remains one of the most well received ever in the popular science genre. The book winds from mathematics to biology, to physics, crystallography, and more. Gamow, George; Stern, Marvin (1958). Puzzle-Math. Viking Press. ISBN 978-0-333-08637-7. Thirty Years That Shook Physics: The Story of Quantum Theory, 1966, Dover Publications, ISBN 0-486-24895-X. Throughout these books, Mr. Tompkins is introduced as "C. G. H. Tompkins" to emphasize the notion of cGħ physics. Mr. Tompkins in Wonderland (1940) Originally published in serial form in Discovery magazine (UK) in 1938. Mr. Tompkins Inside Himself (1967), A rewritten version of Mr. Tompkins Learns the Facts of Life giving a broader view of biology, including recent developments in molecular biology. Coauthored by M. Ycas. Mr. Tompkins Gets Serious: The Essential George Gamow (2005). edited by Robert Oerter, Pi Press, ISBN 0-13-187291-5. Incorporates material from Matter, Earth, and Sky and The Atom and Its Nucleus. Notwithstanding the title, this book is not part of the Mr. Tompkins series. George Gamow was the inspiration for Professor Gamma in the Professor Gamma series of science fiction books by Geoffrey Hoyle and his father astronomer Sir Fred Hoyle. ↑ Радиевый институт имени В. Г. Хлопина. Для молодёжи (Radium Institute named after V. G. Khlopin. For young). ↑ He was expelled from the Academy in 1938, but his membership was restored posthumously in 1990. ↑ The youngest corresponding member elected to the Academy of Sciences of the USSR was the Armenian mathematician Sergey Mergelyan, elected at age 24. ↑ V.G. Khlopin Radium Institute. History / Memorial and History / Chronology Archived April 26, 2011, at the Wayback Machine.. Retrieved 25 February 2012. ↑ Z. Physik 51, 204 (1928) G. Gamow, "Zur Quantentheorie des Atomkernes". ↑ R. W. Gurney and E. U. Condon, "Quantum Mechanics and Radioactive Disintegration" Nature 122, 439 (1928); Phys. Rev 33, 127 (1929). ↑ Friedlander, Gerhart; Kennedy, Joseph E; Miller, Julian Malcolm (1964). Nuclear and Radiochemistry (2nd ed.). New York, London, Sydney: John Wiley & Sons. pp. 225–7. ISBN 978-0-471-86255-0. ↑ Gamow's derivation of this law Archived February 24, 2009, at the Wayback Machine..
↑ My World Line G. Gamow, Viking Press, 1970, chap. 5 The Crimean campaign. ↑ Gamow, G.; Hynek, J. A. (1 March 1945). "A New Theory by C. F. Von Weizsacker of the Origin of the Planetary System". The Astrophysical Journal. 101: 249. Bibcode:1945ApJ...101..249G. doi:10.1086/144711. ↑ Gamow, G. (1946, October 1 & 15), Physical Review. ↑ Gamow, G. (1968) 'On the Origin of Galaxies', Properties of Matter under Unusual Conditions (Edward Teller 60th Birthday Volume). New York; John Wiley & Sons, Inc. Interscience Publishers. ↑ Gamow, G. (1935), Ohio Journal of Science, 35, 5. ↑ Chandrasekhar, S., Gamow, G. and Tuve, M., (1938), Nature, May 28. ↑ Gamow, G., Schoenberg, M., (1940), Physical Review, December 15. ↑ Alpher, R. A., Bethe, H., Gamow, G., (1948), Phys. Rev., April 1. ↑ Gamow, G., Teller, E., (1939), Nature, January 21 and March 4. ↑ Gamow, G., (1948), Nature, 162, October 30. ↑ Alpher, R. A., Gamow G., Herman R., (1967), Proc. Natl. Acad Sci., 57. ↑ Segrè, Gino (2000-03-30). "The Big Bang and the genetic code". Nature. 404 (6777): 437. doi:10.1038/35006517. PMID 10761891. ↑ "DNA: An "Amateur" Makes a Real Contribution". Retrieved 2007-07-11. ↑ The twenty combinations are: A+C+G, A+C+T, A+G+T, C+G+T, 2A+C, 2A+G, 2A+T, 2C+A, 2C+G, 2C+T, 2G+A, 2G+C, 2G+T, 2T+A, 2T+C, 2T+G, 3A, 3C, 3G, 3T. ↑ Watson, J. D. (2002). Genes, Girls, and Gamow: After the Double Helix. New York: Random House. ISBN 0-375-41283-2. OCLC 47716375. 1 2 3 Cole, K.C. (2009). Something Incredibly Wonderful Happens: Frank Oppenheimer and the World He Made Up. Houghton Mifflin Harcourt. ISBN 978-0-15-100822-3. ↑ ANDERSON: "What, uh, one thing I’m fascinated with is, of course, George Gamow left the university in ’59 , and Edward Teller had left in 1946  and went to the University of Chicago. But do you have any recollections of maybe some of the, anything between Dr. Marvin and Dr. Gamow, as far as, just before he left and went to Colorado?" NAESER: "Ah, no, I don’t know of any. I know Gamow made no, never did hide the fact that he was an atheist, but whether that came into the picture, I don’t know. But the story around the university was that Gamow and Mrs. Gamow were divorced, but they were in the same social circles some of the time, he thought it was better to get out of Washington. That’s why he went to Ohio State." The George Washington University and Foggy Bottom Historical Encyclopedia, Gamow, George and Edward Teller, October 23, 1996. ↑ Grote Reber. "The Big Bang Is Bunk" (PDF). 21st Century Science Associates. p. 44. Retrieved 28 May 2012. After the initial mathematical work on relativity theory had been done, the Big Bang theory itself was invented by a Belgian priest, Georges Lemaître, improved upon by an avowed atheist, George Gamow, and is now all but universally accepted by those who hold advanced degrees in astronomy and the physical sciences, despite its obvious absurdity. ↑ Simon Singh (2010). Big Bang. HarperCollins UK. ISBN 9780007375509. Surprisingly, the atheist George Gamow enjoyed the Papal attention given to his field of research. ↑ Preliminary Guide to the George Gamow Papers, 1934–1955, Special Collections Research Center, Estelle and Melvin Gelman Library, The George Washington University. Interviews with Ralph A. Alpher and Robert C. Herman conducted by Martin Harwit in August, 1983, for the Archives at the Niels Bohr Library, American Institute of Physics, College Park, Maryland. "Ralph A. Alpher, Robert C. Herman, and the Prediction of the Cosmic Microwave Background Radiation," Physics in Perspective, 14(3), 300–334, 2012, by Victor S. Alpher. Wikimedia Commons has media related to George Gamow. Oral History interview transcript with George Gamow – a lengthy interview, a few months before Gamow died; includes reminiscences about his family, education, career, and writing.